When JoAnn Reinhard, her husband and two children first stepped onto Petty’s Island, a 323-acre strip of land nestled in the Delaware River between Philadelphia and Camden, they couldn’t believe the amount of trash beneath their feet. It was 2010. The island, dotted by giant, rusted oil storage tanks, a once-bustling cargo marine terminal and plenty of cracked asphalt, had been closed to the public for years, save for the employees who crossed the narrow 36th Street bridge to work there. The Mount Laurel family of four, who found their way to the island as volunteers participating in a cleanup effort, were struck by all the Styrofoam, bottles, miscellaneous plastic and large tires washed up from the river. Today, that picture is changing. Citgo, the Venezuelan oil company that owns Petty’s Island, is preparing to begin a massive cleanup effort before turning the island over to the New Jersey Natural Lands Trust, an independent agency within the state Department of Environmental Protection that aims to preserve land in its natural state. 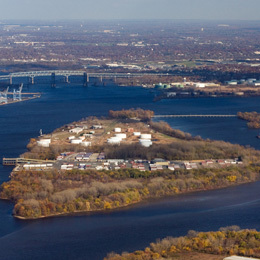 The trust, which plans to make Petty’s Island a nature preserve, currently holds a conservation easement on the island, but Citgo is assuming all responsibility for complete groundwater and soil remediation, where needed, and removing any structures associated with former petroleum operations, which ceased in 2009. Additionally, Citgo is contributing a $2 million stewardship endowment to manage the island, along with a $1 million endowment to be used as seed money for a nature center, according to the trust’s board chairman, Michael Catania. In the meantime, some industrial operations are continuing until the end of December, when Crowley Maritime Corp. will move its operations to Eddystone, Pa. If plans come to fruition as imagined, Petty’s Island, with its 400-year history that includes everything from pirates to gambling Quakers and a possible role in the slave trade, will begin a new chapter that even the tiny island’s biggest champions didn’t always think was coming. After years cut off from civilization, grand, but failed redevelopment plans, a passionate grassroots campaign and an unlikely alliance of environmental groups and a big oil company, Petty’s Island—finally—stands on the cusp of a renaissance. When Bob Shinn runs the occasional tours of Petty’s Island, he prefers to greet visitors in Algonquian. The name, which loosely translates to “where the panther ran,” is where the island’s story really begins. According to an entry on Petty’s Island in The Encyclopedia of Greater Philadelphia, published by Rutgers University– Camden and authored by Shinn, Quaker Elizabeth Kinsey purchased the island from the Lenape in 1678, with a deed that spelled out the Native Americans’ right to continue to hunt and fish on the island, so long as they promised not to “kill her hogs or set her fields aflame.” The island has had several owners since, including William Penn, and earned its current name from Philadelphia merchant John Petty, who bought it in 1732. In the years after, legends abound. Quakers made their way to the island as a refuge to dance and gamble. The famous pirate Blackbeard is believed to have docked at the island, and Benjamin Franklin is said to have spent a night there in 1723. There is indirect evidence of a “cargo of slaves” arriving on the north end of the island in the 1760s. In the 1880s, the island was home to a dancing and drinking resort called Willow Grove. In 1917, Citgo, then known as Cities Service, purchased 50 acres on the island. Since then, Petty’s Island has been an industrial hub, at its peak serving as an important port for oil burning ships. The island was coveted by Philadelphia but considered part of Camden, before the city ceded the island to Pennsauken Township and tried, unsuccessfully, to get it back. In 2004, Pennsauken officials approved a plan to use eminent domain to acquire the island and redevelop it as a high-end hotel, conference center and golf course. Those plans fizzled, however, when Citgo discovered a rare pair of American bald eagles nesting on the island, along with other threatened wildlife, and instead offered to donate the island to the trust (cleanup costs related to the pace of the development project were also reportedly a concern). After years of grassroots advocacy, the Delaware Riverkeeper Network and its partners in the Save Petty’s Island Coalition convinced decision-makers at the New Jersey Natural Lands Trust to vote to accept Citgo’s donation. “We believe that the value of this project exceeded that of a commercial redevelopment and is consistent with our corporate values of environmental stewardship, community involvement and support of educational opportunities,” McCrossin said. “This island has gone through every arc of land use, from the time the Dutch and Swedes first arrived, from agriculture right up through industrial, with railroad transit and ships, and now, it’s going back to nature again,” Shinn says. “That never happens. And it’s only by the luck of a sequence of events that was destined to happen, but didn’t happen. And that’s the island’s whole history. There are so many stories about what people tried to do that would have determined an alternate future for the island than what actually occurred. As part of the conservation easement agreement, Citgo and Crowley are removing the buildings, tanks and industrial debris on the island, Catania says. Crowley will also remove the paving, leaving only the road to the proposed nature center—a Crowley building with spectacular views of the Delaware River and the city skyline—and a parking area. The southern par t of the island below Crowley has already been cleaned up and signed off on by DEP, Catania says. As for Reinhard, who still participates in cleanup efforts, she looks forward to one day visiting the island as a nature preserve with her husband, Earl, 20-yearold son Robert and 18-year-old daughter, Amanda. After many an afternoon spent lugging oversized tires and picking up garbage, that visit will be well worth the wait.